Butterflies are one of the natural riches of Indonesia, and Bali Butterfly Park offers the opportunity to encounter rare and endemic species from all over the archipelago. Hundreds of colourful butterflies are released daily. Among them are famous species such as the Bird Wing Butterfly (Ornithoptera and Troides) Swallow tails and Great Mormon (Papilio). This is one of the biggest butterfly parks in Southeast Asia. Discover part of the beautiful scenery of Indonesia, as first discovered by explorers and scientists like Wallace. Hours: Daily 8am-5pm. Admission Rp30,000. Taman Kupu Kupu is in Wanasari just 5 km North of Tabanan. By visiting you are supporting the butterfly hatching program of species from all over Indonesia. 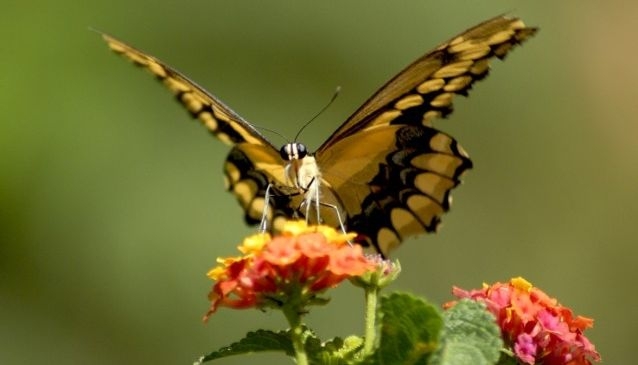 The best time to see the butterflies is early to mid-morning when they arise and take flight. There is also a really nice static display of butterflies from all over Indonesia. You might want to combine the Butterfly Park by continuing about another 10 km to Pura Luhur Batukau (temple on the slopes of Guning Batukau Bali's second highest mountain) and from here it would not be far to visit Jatiluwih Rice Fields on a stretch of 18 km road with truly beautiful views.